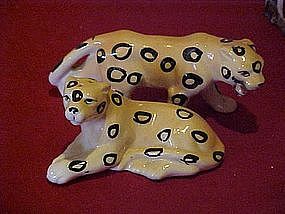 This vintage set of wild cat shakers are hand painted glazed ceramic. Measures 2 1/4" tall and the largest is 5 1/4" long. Perfect condition but one of the corks is missing.